Sumeet Singh Manglotra, a colleague of mine had recently obtained a road bike and was getting into long distance rides. He kind of tagged me along when he registered for the first brevet of the season. We did our usual Kolar route before and he was pretty comfortable with centuries. On the other hand, my lower back hasn’t been that great since the beginning of this year. Coupled with a recent gum infection and a stiff neck, my confidence was shaky at best. The longest I had ever gone was 163 kms. It was from Bangalore to Mysore on the first day of TfN’16. This 200 km long BRM was going to be the longest I was going to ride at one stretch. There weren’t any paining muscles (or gum). I shook off my shaky confidence and decided to approach it with as much positivity as possible. Every year November 1 is celebrated as Karnataka Rajyotsava (Karnataka State formation day). 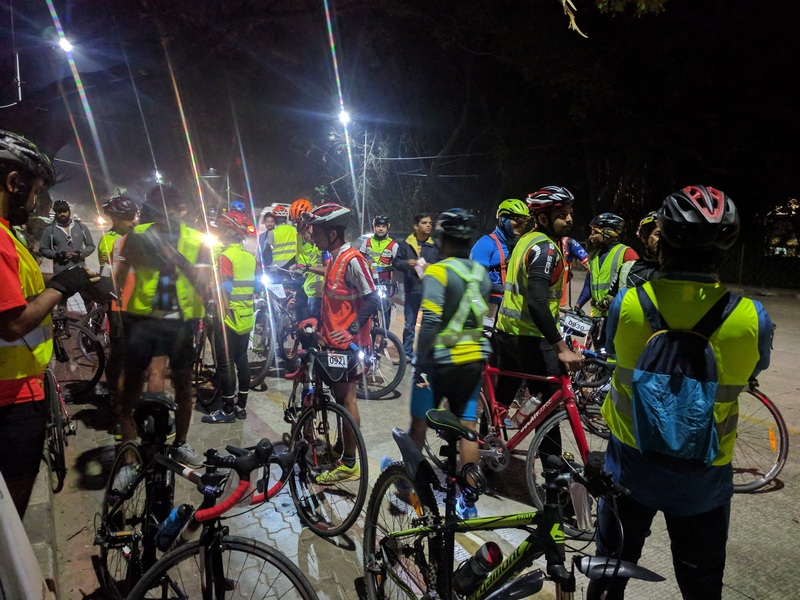 Being a state holiday, it was a good day that Bangalore Randonneurs had chosen to organise the first BRM of 2017-18 season. I woke up at 3:30, freshened up and had a large cup of green tea before Sumeet came to my house with his car. His car was already equipped with a rear bike rack and he had mounted his Cannondale CADD10 on one of the mounts. He helped me clip on my Merida and off we went to Krantiveera Stadium, the start and end points of the brevet. 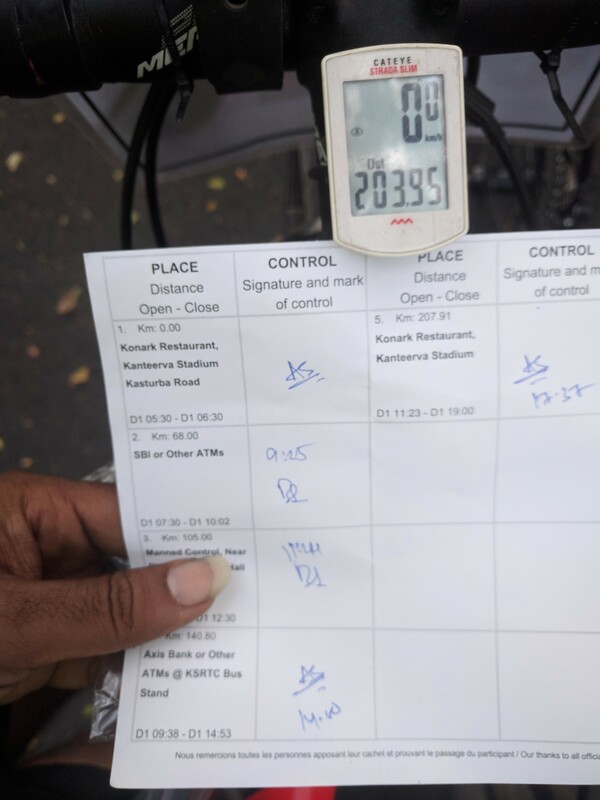 The organisers (Alok Shostri and fellow riders who were volunteering) went through the mandatory equipment check – ACP legal bike, helmet, front and rear lights, Audax India registration number pinned to the bike and reflective vest – before handing us our brevet cards. Sixty-six riders had assembled in front of the stadium – a good turnout by any standards. At around 5:50, Alok flagged-off the BRM and we were all on our own. 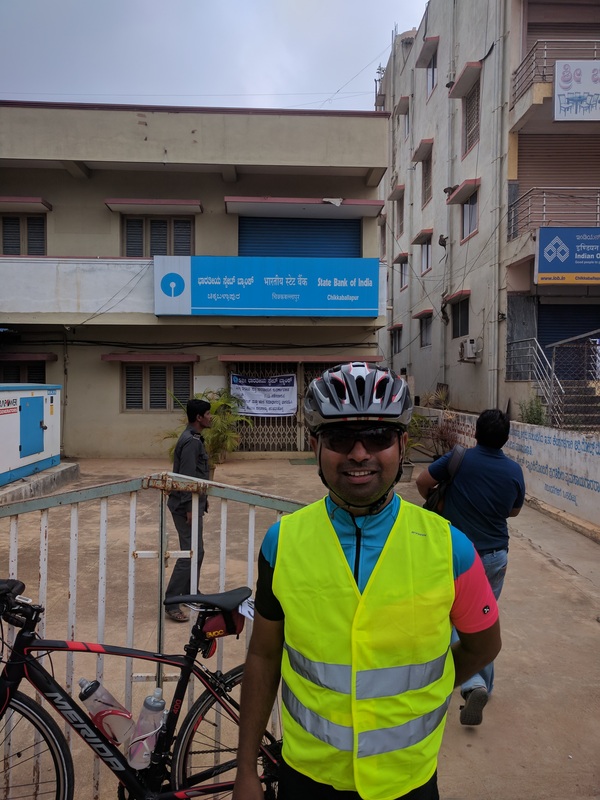 The route wound through the city and Outer Ring Road, before heading past the airport towards Chikaballapura – the first unmanned checkpoint, where a rider must take a selfie in front of the SBI branch or any of the other ATMs. 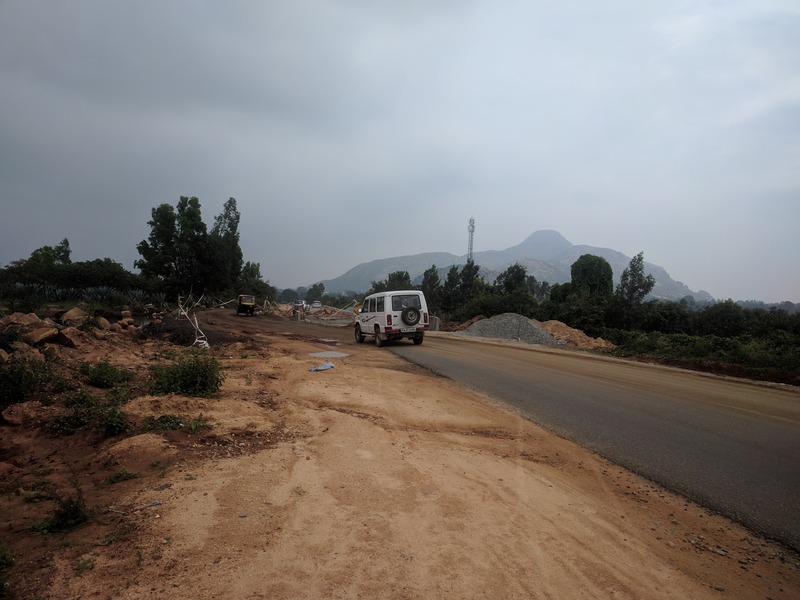 From there, riders would have to take the state highway that connected Chikaballapura and Chintamani, where the timings would be recorded at a manned checkpoint; followed by a southward bound state highway to Kolar town – the third checkpoint, where the rider must take a selfie at KSRTC bus stand. After that the route follows the Kolar-Bangalore Highway back to the city and subsequently back to Krantiveera Stadium. Sumeet had left me behind pretty early on as I missed two cue points right inside the city. I had to trace back a bit on both counts. Once I was on Outer Ring Road, the route was pretty straight forward. I kept a nice pace of 22 km/h average and pedaled on the familiar tarmac. I knew that I should not ride any faster as I had a long way to go and this was not a race. The first stretch of the route, till Chikaballapur was uneventful. Somewhere along the way, I felt hungry. I stopped at a tea shop, bought a packet of chocolate biscuits and some bottled water, and moved on. Inside Chikaballapur, I rode with Vivek, who took my checkpoint photograph. He decided to wait for some of his friends. I bid him adieu and moved on. The route from Chikaballapur to Chintamani wasn’t that good. The rough roads killed my momentum very frequently. Someone on a local cycling group had put out a warning. It wasn’t as bad as he had claimed it to be. Still the constant jerks caused a lot of upper body fatigue. I could feel the pain in my lower back return. The constant drizzle didn’t help either. I am standing on the road. A small stretch on one side is getting laid. The entire 36 km stretch was punctuated by such construction. This is when I realised that I had not put on my gloves. I had left them at home! I stopped numerous times to stretch my back and give my palms some rest. I made sure that I my breaks coincided with tea stalls to replenish some of my energy. I also topped up on my biscuit supply. Many people (mostly locals and passers-by) were curious to know what I was doing. I am sure the other riders had also similar experiences. I tried to converse in Kannada but more often than not, had to give up midway. A lot of school-kids extended their arms for a high-five. I had learned from Manjeet during TfN’16 not to disappoint them. Alok waited before Chintamani. He marked my brevet card while I gulped an entire packet of curd from his car. The route from Chintamani to Kolar was very scenic. It passed through villages small hills and and lakes. 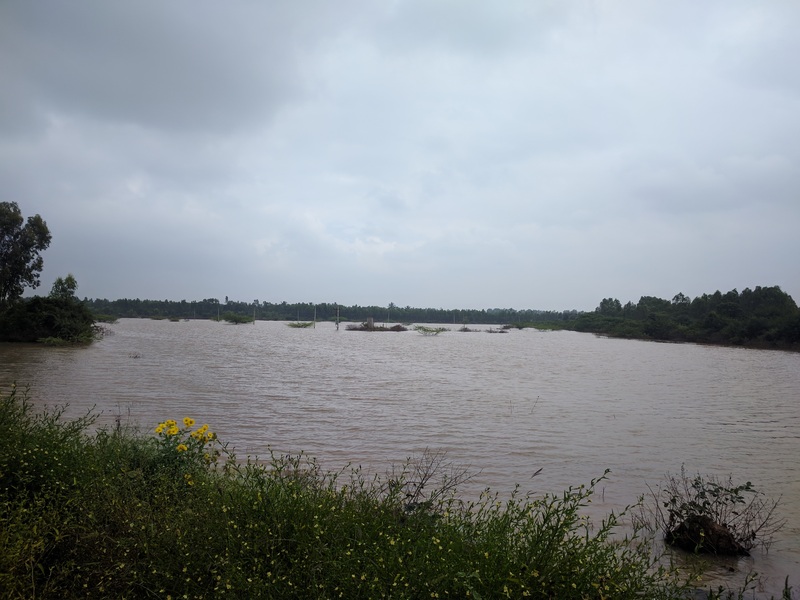 Karnataka had seen an awful lot of rains during the last few months. The lakes were all filled up. The jerks from the last stage adversely affected my speed. I was barely holding on to 19 km/h. At times my speed dropped to 15 or 16 and I had a hard time accelerating again. This is when I had the thought if I should retire my pair of puncture-proof Marathon Plus tyres. These were heavy (900 gms each) and had a lot more rolling resistance (>20% when compared to Conti’s puncture resistant tyres). I did not find that many tea shops in this stretch either. Most were closed and I had to rely on my stock of biscuits. I reached Kolar at 2:00 pm, took a selfie at KSRTC bus stand and moved on. There was so much traffic and chaos that I wanted to get on the highway as soon as possible. Once I was on the highway, I was on familiar roads again. About 10 kms ahead of Narsapura CCD, I got a call from Sumeet. He was somewhere behind. I did not understand exactly where he was but he said he was with some fellow riders. I did not realise that I had crossed him. Once I was in Hoskote, I had almost exhausted my stash of biscuits. I could feel the signs of bonking were about to kick in. It was sheer accident that I came across a tea stall with a large steel boiler somewhere near the mosque area of Hoskote. The boiler intrigued me. I sat down and gulped two cups of tea and four large bakery biscuits. I felt good. 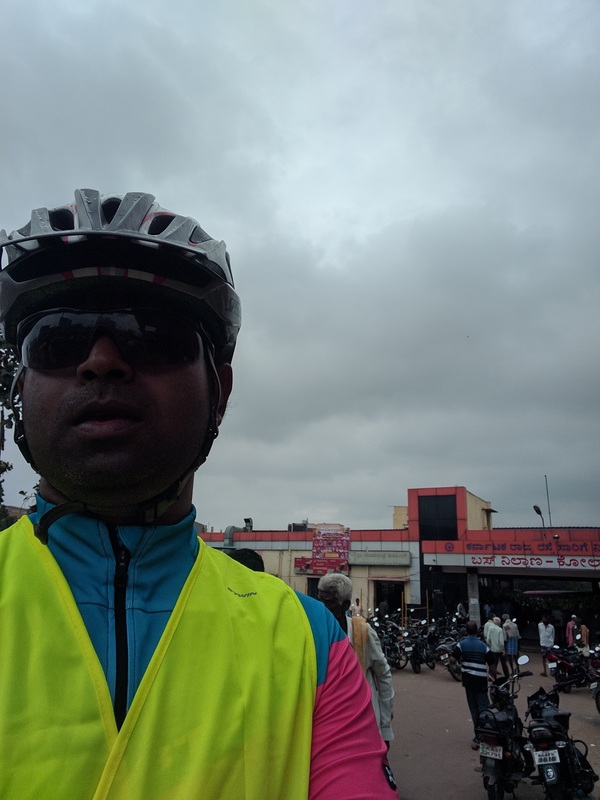 From Hoskote to the end point, I rode with Bhavani Suryanarayan and Sanat Rath. The former is a two-time Super Randonneur and the latter is a cycle enthusiast (he even owns a unicycle). This was the most irritating stretch as my momentum was constantly broken by traffic pile-ups and signals. While my fellow riders jumped signals and walked across, I decided not to do so. I usually find jumping signals uncomfortable. Once we were at the end point, I got my card signed and deposited it for homologation. My signed brevet card and my cyclo-computer showing 203 kms of ride. Sumeet arrived twenty minutes later. After some socialising with fellow riders, we both headed back home. 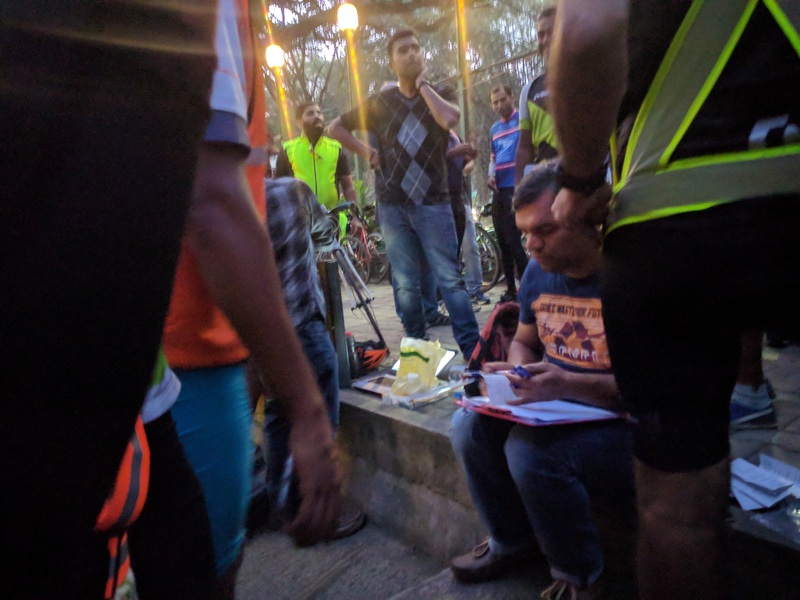 Alok signing the cards for the riders and putting on the final times.